MATcutter.com has Black Core, 6 Ply Archival Mats in Precut and Custom Sizes. Conservation Mats are paper mats that have had acid and acid-producing properties removed to emulate the high standards of cotton mats. Archival conservation mats use pigmented inks which resist fading versus water based inks in Standared mats and are 100% alpha cellulose (no recycled material). Conservation Mats also allow you to have a black mat, for example, with a black core that shows on the 45 degree bevel of the window. 6 ply conservation mats are 50% thicker than standard mats. Our Conservation grade mats also contain Nielsen Bainbridge Artcare®, patented microchambers that proactively trap and neutralize harmful gases that can cause fading, yellowing and deterioration. Artcare technology is trusted by many of the world’s leading museums and archives, including the Library of Congress, to protect historic artifacts and documents. 6 ply, archival black core "blanks"
VERY THICK and black core in archival matting. Outside of mat is already cut straight and true. Cut your own exciting 6-ply mats with high contrast white top color and black core! 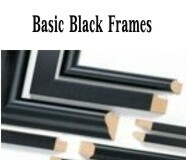 Or, create monochromatic look with black on black core. Suitable for photography, prints and originals. All mats are 6 ply archival mats, buffered by calcium carbonate and include Artcare®. Artcare technology is added to the mats and fights acidification from the atmosphere and surrouinding materials. A recognized and patented process that protects your image from deterioration.